The Bling Box is a monthly subscription that brings Kalypso TwistZ® unique interchangeable jewelry right to your door. You will never be more excited to see your mailman coming with your purple package! "With our busy lifestyles we need convenience and simplicity. We created the Bling Box with this in mind. Everyone loves jewelry, and now with the Bling Box, updating your collection has never been easier." 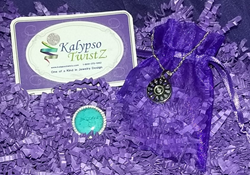 Kalypso TwistZ® is excited to introduce the Bling Box, the latest addition to Kalypso TwistZ Interchangeable Jewelry. The Bling Box is a monthly subscription that brings unique interchangeable jewelry right to the customer’s door. Subscribers of the monthly Bling Box will receive a one time starter kit that includes one interchangeable pendant base, one necklace chain, and the first month’s Xpression free. Each month the customer will receive one new Xpression to change their style and add to their collection. Also, with their Bling Box membership they will receive exclusive “members only” emails, discounts, and special offers. “With everyone’s busy lifestyles people need convenience and simplicity. We created the Bling Box with this in mind. Everyone loves jewelry, and now with the Bling Box, updating your collection has never been easier. I’m excited to share this unique product now on a larger scale,” states Cheryl McAlarney CEO & Founder. There is no better time than now to become a “blingsetter” by taking a peek at Kalypso TwistZ!